Making traditional spritz cookies has never been so easy! Cookie Pro™ Ultra II is designed to be the easiest to fill, most comfortable press you've ever used. And, with 16 terrific shapes, including 4 fun mini cookie designs, your holiday cookie baskets will be more festive than ever! Includes complete instructions and delicious recipes. 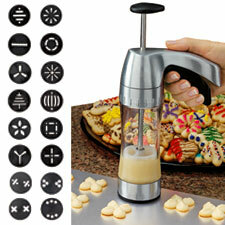 Perfect for making spritz cookies!